The concrete-tile roof used on the Clubhouse at Castle Pines is designed to complement the surrounding Colorado environment. As seen on the cover of Architectural West Magazine – The Clubhouse at Castle Pines is famous for its classic and rustic upscale atmosphere, featuring wood ceilings and mountain-inspired furnishings. Large-scale windows provide stunning, panoramic views of the surrounding mountain range as well as of the signature golf course designed by legend Jack Nicklaus. The facilities are set just 30 minutes south of downtown Denver, Colorado, within the prestigious Castle Pines community amidst rugged, picturesque terrain. During a recent $5 million renovation, a gorgeous 6,000 sq.ft. outdoor terrace was built, allowing guests to dine and socialize comfortably outdoors in a truly inspiring setting. 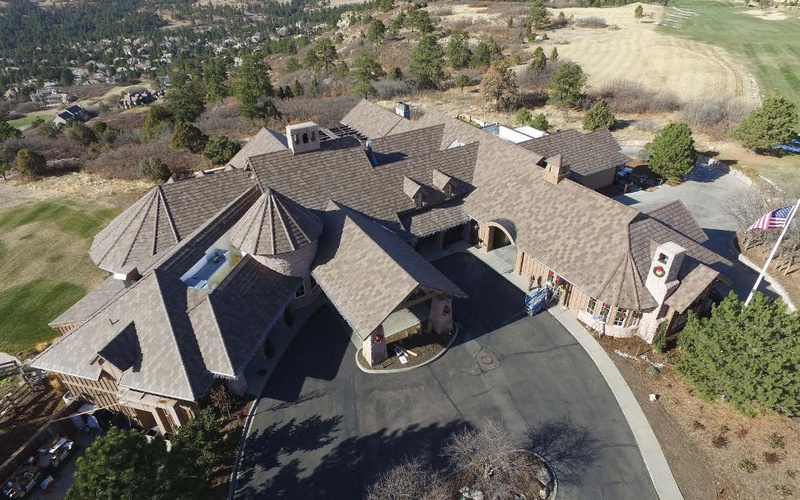 While the Clubhouse at Castle Pines renovation was underway, it was decided that the facility needed a new roof. The existing wood• shake roof had not only aged, but because of its composition, was also highly susceptible to fire and hail, two major concerns associated with the topography and seasonality of Colorado. Moore’s team, in conjunction with the leadership behind Castle Pines, reviewed numerous roofing materials in search of the right roof system. With a primary focus on finding a solution able to withstand the elements, the system also needed to enhance visually the aesthetics of the clubhouse, and celebrate the architectural style of the luxury homes surrounding it. After researching roofing materials, the team ultimately selected Bora!® Roofing’s Class 4 hail-rated concrete tile. The benefits provided by concrete roof tile include superb durability and a lengthy lifespan of up to SO years or longer. Concrete tile is also considered a resilient building material that helps protect against natural elements such as storms, hail, fire, snow, and wind. The roof is often the first point of contact for these conditions, acting as the structure’s first defense, and concrete tile excels in its protective abilities. Concrete roof tile is also an eco-friendly roofing material. It is manufactured using locally sourced, naturally occurring, and abundant geologic material. Boral’s tile incorporates no chemical preservatives and is 100% recyclable at the end of its life on the roof. From an aesthetic viewpoint, the color and profile selection of the tile were important. The tile not only had to perform, it had to match the structure’s architecture and design color palette. Boral’s Saxony Slate Impact Tile in the color Western trail was chosen to complement both the design of the structure and the natural surroundings, creating a seamless aesthetic bridge between the two. The roof retrofit and clubhouse improvements weren’t the only recent upgrades to grace Castle Pines. The golf course was renovated earlier in the year to help improve playability for golfers. An improved variety of perennial grasses was added, offering a more durable turf. New sod was also applied to the course to help improve irrigation distribution and drainage alongside the installation of concrete curbing to increase surface firmness at each hole. “With the clubhouse renovation and the improvements to the golf course, Castle Pines will hold onto its reputation as an unparalleled destination for enthusiasts for many years to come,” said Moore.